April 12, 2007, MOAB Utah - Rhino Off Road Industries (Henderson, NV) maker of the Rhino Rough Terrain Vehicle (RTV) and Sway-A-Way, Inc. (Chatsworth, CA) maker of the high quality RaceRunner performance shock line, have announced the official release of their new products, the Rhino RTV a new class of off-road performance vehicles and the Sway-A-Way Air Shock for the competitive and heavily modified rock crawling vehicle. The Rhino RTV a unique vehicle with features and benefits of both an ATV and a Monster Truck offered the perfect opportunity for the latest in Sway-A-Way, Inc. and RaceRunner technology to be showcased. The Sway-A-Way Air Shock used in the Rhino RTV will be available in 12, 14, 16, and 18-inch lengths and retail for approximately $225 each. The shocks will be available at authorized Sway-A-Way, Inc. dealers in June 2007. Sway-A-Way, Inc., a Company that has been involved in every aspect of performance off-road suspension for more than 30 years entered this new arena with a great deal of enthusiasm and excitement. 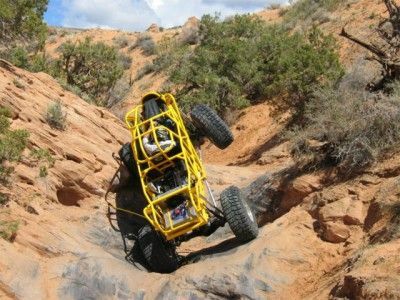 The Rock Crawling market, which is still the fastest growing off-road motor sport in the country, offers yet another avenue in which Sway-A-Way, Inc.’s highest quality, best performing, shock technology can be highlighted.